What broke today. What it means he can do, and what the repercussions are rest of the season. Also some comparison to Ham would be good. As you can see, he asked me to explain where both Hamilton and Vettel stand in terms of their powerunit allocations and what the repercussions of any further failures could mean to the pair. Let's start with Hamilton as the Brit’s allocation and penalty situation is a little more clean cut. The Mercedes driver has now used his entire 4 component allocation of ICE, Turbo and MGUH, meaning that if he needs to take a fifth he’ll be subjected to a ten place grid penalty, followed by a further 5 place penalty if he needs to replace another element for its fifth iteration. He is still able to introduce another MGUK, Energy Store and Control Electronics without penalty, as he's only used 3 so far. Vettel’s penalty situation and allocation is a little more complex owing to the way in which his qualifying session unfolded in Malaysia. Ferrari had initially earmarked Malaysia as the waypoint where they'd introduce their apparently more potent 4th iteration of ICE. However, arriving at the circuit they made it clear they planned to extend their run plan and introduce the new specification in Japan next week instead.However,an issue that arose during Free Practice 3 put pay to that and led to a mad scramble as the Ferrari mechanics rushed to mount the v4 ICE after a minor issue was detected on the FP3 engine. With his pitcrew having done a stellar job of replacing his powerunit Vettel made his way out in Q1 only to find he was missing a substantial chunk of power, with what appeared to be a loss of turbo pressure. 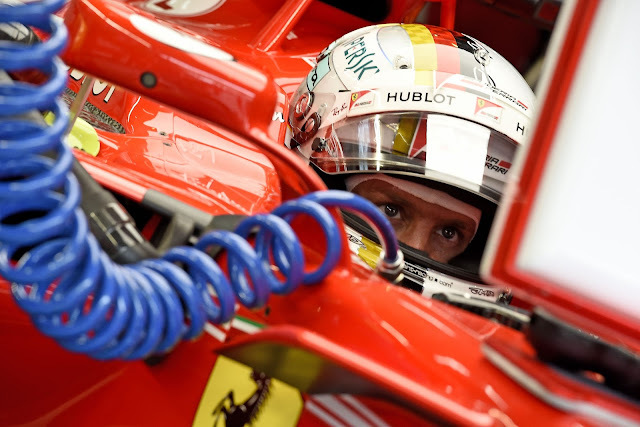 Unable to set a representative time Vettel retreated to the garage to assess what was wrong and didn't return to the track, resigning the German to the prospect of starting the race from the back of the grid. Still upbeat and thankful to his crew for the expedient nature in which they'd got his car ready, he made his way around the garage offering an abundance handshakes. A back row start might be disheartening, especially with Hamilton on pole, but there are some plus points that arise from the situation with Seb able to add some extra parts to his allocation. 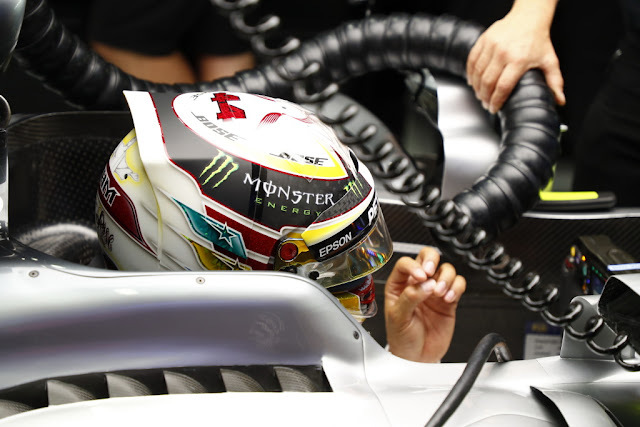 Having now taken the fourth and penalty free ICE into his allocation and having already installed his fourth Turbo, ES and CE several races ago he could run all new versions of these in the race tomorrow without accruing any more penalties. After all you can't go any lower than last, just ask Fernando or Stoffel who've been in this boat numerous times already. The talking points that will come from this are how adding two new specification ICE’s at once (along with the retention of v3, if it turns out to be ok when inspected - although it'll likely not be needed now in anycase) is going to improve the performance available to the Ferrari driver for the last six races. After all the use of high power modes is usually restricted on a mileage basis, something that won't be a problem for Vettel now, potentially giving the Ferrari driver the edge in qualifying and wheel-to-wheel battles. This might turn out to be more important if both championship protagonists share the tarmac at some point in the last few races, as Hamilton and Mercedes in general are already pushing the outer limits of their allocation and mileage quotas having taken their fourth components into their allocation back in Spa. Having said that, Mercedes might have taken them into their allocation earlier but that doesn't mean they expect to exceed each components mileage quota all being equal. However with quality now kind of out of the window, given Vettel has upto five ICE, Turbo’s and MGUK’s in his allocation it might force Hamilton/Mercedes into a position that forces a failure, grid penalties or a points paying result (remember Malaysia 2016). The one saving grace for Mercedes is that their reliability record is almost impeccable this year though, with components only changed when scheduled, the only exception (from memory) being Bottas’ Turbo failure in Spain, when the Finn retired from third place dropping 15 points in the process.